Dijver 7, 8000 Bruges, Belgium. An elegant 15th century mansion in Bruges, converted into the stylish luxury hotel "Hotel de Tuilerieën", with a privileged location, alongside one of the most picturesque canals of Bruges, Den Dyver, immediately plunges you into the enchanting atmosphere of the historic city of Bruges. All the hotelrooms are unique and decorated by Pieter Porters. Our hotelfacilities like indoor swimming pool, private car park, sauna, jacuzzi and steambath are free at your disposal! Also taste our copious champagne breakfast buffet! Don't forget to visit our restaurant "Le Menu Belge". 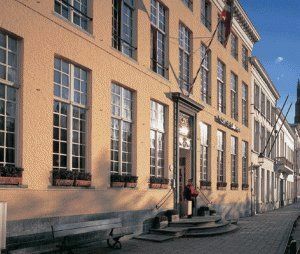 Hotel De Tuilerieën, the place to be for an unforgettable stay in Bruges! Internet services and WiFi are available (extra charge). 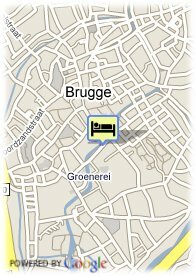 Valet parking, Paid covered parking at the hotel (25.00 €). Near exhibion centre, Near trainstation, Park, Centre, Museum Area, Near the historic centre, River, Panoramic view. When the reservation has not been used and no cancellation has been made at the hotel: the first 4 nights will be charged. Children less than 12 year(s) old: free of charge. For older children and adults 40.00 € for each additional bed is charged. Hotel De Tuilerieën in Bruges has a house bar, champagne breakfast buffet and a restaurant. The restaurant is closed on tuesday and wednesday. Bruges, perhaps the loveliest city in all of Western Europe. An oasis of medieval calm, fascinating sights and a rich patrimony of culture. In the historic heart of Bruges, along the picturesque canal, Den Dyver, this high-class hotel will accommodate you every desire in a refined atmosphere that will satisfy even the most far-reaching requirements of any tourist or businessperson in Bruges.